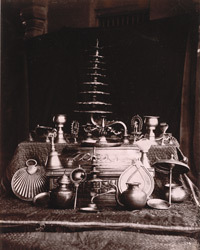 Photograph of brass and copper vessels from the Kumbheshvara Temple at Kumbakonam, taken by Alexander Rea around 1892, taken by Alexander Rea around 1892, from the Archaeological Survey of India Collections. The Kumbeshvara Temple, built in the 17th century during the Nayaka period, is the largest Shaiva temple in Kumbakonam. The temple has remarkable silver conveyances (vahanas) used to transport the images of the deities during the festivals.